“New customer relationships are starting online more than ever before.” An informational website gives validity to your venture. W3 ENTITY® provides online brand exposure and support for establishing and maintaining your businesses online web presence. Your businesses online profile presence is often the first contact you have with a customer. W3 ENTITY® recognizes the significance of building trust and validity to the World Wide Web (W3) presence for your business or product. Website engineered for your (www.yourBusinessEntity.com) business entity’s World Wide Web profile by developing and enabling your need to convey what’s most important to your business goals. We specialize in small business, startups, and sole proprietors. Our goal is to provide a well-developed solid core World Wide Web (W3) presence that is cost conscious. The establishment of any type of business entity in today’s progressive technology driven arena demands a Web Presence that is as solid as “Brick and Mortar”. W3 ENTITYs goal is to provide the most cost effective cross section of what the web has to offer in establishing your businesses web presence and overall online business profile. A businesses web presence plays an intrinsic role in marketing, and advertising your business, opening opportunities for success. W3 ENTITY® provides an effective business web presence through a wide range of services wrapped into one package for your companies’ web profile. 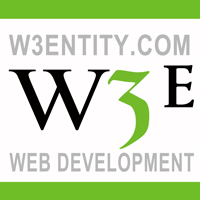 W3 ENTITY® Provides a foundation of an established business entities digital online identity by using today’s web development best practices for creating an “Organic” way of getting your entity found.